I have often been told like to think of myself as an awesome gift giver. 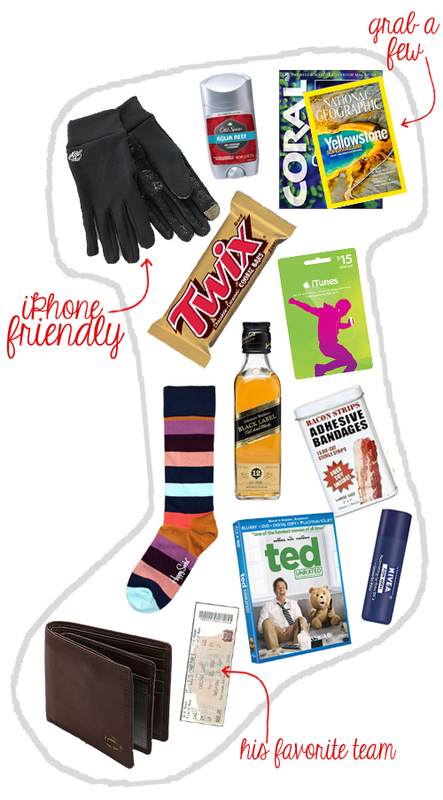 When it comes to stockings, there are tons of “gifts for him” ideas but they never feel right. Probably because Tim doesn’t need cufflinks, he’s not so much an artsy type, and if he needs anything techy he probably already bought it. Not to mention how many $20 gifts fit in a stocking….too many. Here is my version of a perfect boyfriend stocking. I should note that our stockings could fit a baby elephant, so I have to have enough presents to fill that bad boy to the brim. He is so spoiled. Tim…you can avert your eyes now. Mmmmkay. Almost everything above can be found at your local convenience store. A favorite new movie, a couple magazines, and fun socks will all put a giant smile on his face. I love throwing scratchers in a new wallet for an added surprise. Boys don’t like buying stuff like chapstick…but they love when you buy it for them. Just steer clear of shimmer and tint okay ladies. Throw some manly deodorant or toiletries in for a squeaky clean boytoy. You seriously can not go wrong with gift cards, although sometimes they seem impersonal. Guys love apps and they love music, but I would rather buy an iTunes gift card than try to stock up his iPod. What Lady Gaga doesn’t make you bust out the brush-microphone honey? Speaking of iPod’s…make sure you pick up some techy gloves. Best investment I have ever made, toasty fingers even when I’m texting. Favorite candy and mini bottles of booze, better than a clementine amiright? My favorite thing to put in a stocking is tickets to some sort of event we can go to together. It’s like I am secretly giving myself a present too. Since Tim usually thinks he is just getting undies and candy in his stocking he never expects this little gem. Baseball tickets are the best…go Cards! What do you put in your man’s stocking? Tim sure would appreciate more gift ideas! Ooo you just remind me that I have to see that movie Ted still. I think it’s great by what I’ve seen so mmm, maybe it would make a great Christmas present for Tom. There is usually a lot of dvd’s involved, some stuff for his fishing hobby and ha, a new wallet too! Gotta start shopping before its too late!